Anthony Alberti, also known as Mr. OneTeas, began his career as a street artist. He was an autodidact in graffiti and soon improved his skills by travelling and meeting new people who influenced his work. In the cities he travelled, he regularly left a permanent mark under the form of street art. Mr OneTeas slowly grew into reusing materials he found. In his present work he draws inspiration from his political, cultural and social surroundings. By using certain images and integrating contemporary topics in his art, he provides us with a critical, but nevertheless humorous vision on present-day society. 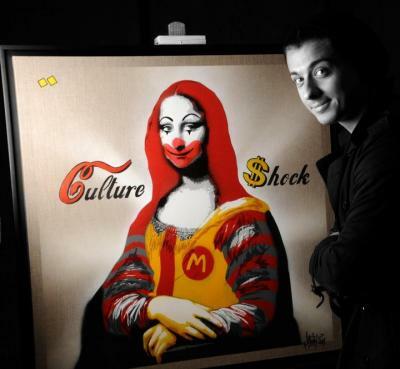 Another significant project of Mr. OneTeas is his work on the streets of Monaco. These streets are noted for their cleanliness, but have been taken over by Mr. OneTeas paint on the walls. Mr. OneTeas, lauded By prince Albert of Monaco, was part of a major exhibition of 500 artworks, ‘Birth of Presionism’ in the Exhibition Hall of the city.